Ever since the days in which cinema was marketing creations like King Kong and Godzilla, Hollywood has had an unremitting fascination with dinosaurs. There is a difficulty many filmmakers have enjoyed confronting over the years: the delightful challenge in creating creatures in movies who have been dead for millions of years. Only recently, in Steven Spielberg’s “Jurassic Park,” were they able to successfully undertake the possibility of making these giant creatures look as realistic as possible using technology as their tool. As a result, we have literally watched these giant unknowns step out of cheesy realizations of the past and into realistic ones of the present. But funny, if you think about it, how special effects are now able to make giant extinct animals look lifelike, but still not ordinary human beings (a la “Eyes Wide Shut”). Disney’s “Dinosaur” is the genesis between the best of both worlds—lush and colorful landscapes of earth encompassing detailed digital recreations of the complex giants that walked the terrain millions of years before mankind. The effect is something awe-inspiring; a brilliant marriage of realism and illusion, Earth and technology, the past and the present. To see it unfold is to be transported back to prehistoric times; you marvel at the visual creatures, yet consider them real characters. My goal is not to simply encourage adults to take their children, though. It is definitely a kid’s movie, but one that gives the older audience something to greatly appreciate. The film opens with a chain of disastrous events, leading us up to the point where an egg of a mother dinosaur floats down the river and is picked up by a Taradactle (forgive me if I do not provide the correct terms; I’m no paleontologist). Towards her nest spot, there is an accident and the egg is dropped into the tree of a family of lemurs, who marvel at this gift from the sky but grow concerned for their safety. One curious member of the tree family opens the cracked egg and brings out a dinosaur who, as the movie so quickly displays, will grow up under the discipline of surrogate monkey parents. As the only dinosaur on this island dominated by lemurs, Aladar (voiced by D.B. Sweeney) watches his friends enter a mating ritual and envies their discovery of love. Before much is said about the topic, though, a stream of meteors enter the atmosphere a few good miles off the coast of the island. The residents gawk at the sight of light streaming through the sky, but then realize the potential danger when one massive space rock crashes into the ocean and sets off a series of tidal waves heading straight for their nesting ground. The artists who have carefully constructed these events have much to be commended on, for the meteor shower looks spectacular and dangerous all at the same time. 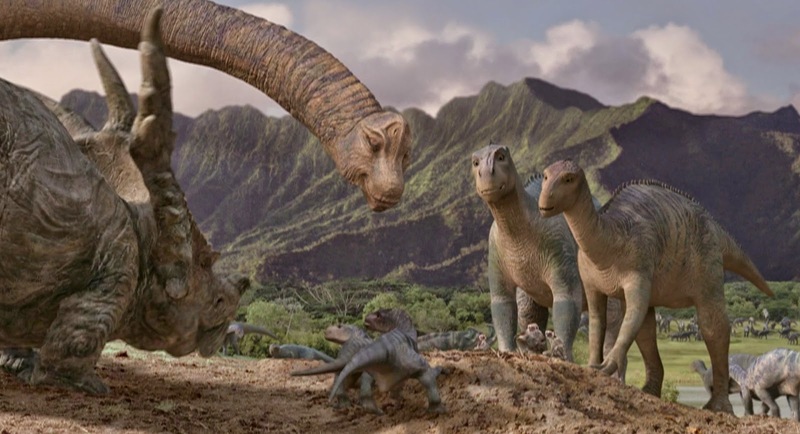 What is to come of Aladar and his family? First, they dive into the ocean to save their lives, washing ashore of the mainland which has been, too, affected by this natural disaster. When they set out on foot in search of food and water, they discover a herd of dinosaurs on route to a valley far to the north where the plants and trees still flourish. Joining them, Aladar and his friends find conflict with their newfound friends; the young creature wants the herd to look out for those who are struggling behind, but the general, a naive blowhard with a thick nose, thinks those who can’t keep up are not meant to survive in the first place. “Dinosaur” might have been a masterpiece. But it falls short of that honor, sadly, because of some light flaws. For one, why does Disney insist that all characters are allowed vocabularies except for the villains (which, in this case, are the Carnotaurs)? Also, what is the purpose of incorporating Velociraptors in the film if only meant to eat up remnants left behind by the herd? And though we enjoy the characters, there is no real stress on their given names; as a result, we often refer to them as “that dinosaur with a flat head,” or “that monkey with gold-toned hair tips.” It takes a good deal of attention to remember that the hero is named Aladar. Thankfully, none of these quibbles undermine the virtues. Impressively detailed are the digital characters, who look and interact like paleontology has imagined them to, and are incorporated into the live action backgrounds with a sense of persistence. Never once does the thought of the dinosaurs being special effects enter our minds; we see them as real, breathing, living creatures whose only problem in life is surviving the harshness of the territory. “Dinosaur,” like so many of the recent products of Disney animation, is an intelligent film that ransacks every nook and cranny looking for something significant to add to the genre (and the live action/digital combination alone should speak for itself). True, the narrative lacks depth, but who can blame it? This is a movie, after all, meant to clearly be taken at surface value. And besides, creatures the size of dump trucks who eat, breed, and are destined to extinction should not be expected to labor on their uncultivated instincts, even though their given dialogue is generally spoken with an intellect that children probably won’t comprehend (“Just what I need—a monkey on my back”). Because of its innovative approach and style, this movie will find reverence in kids and adults alike.